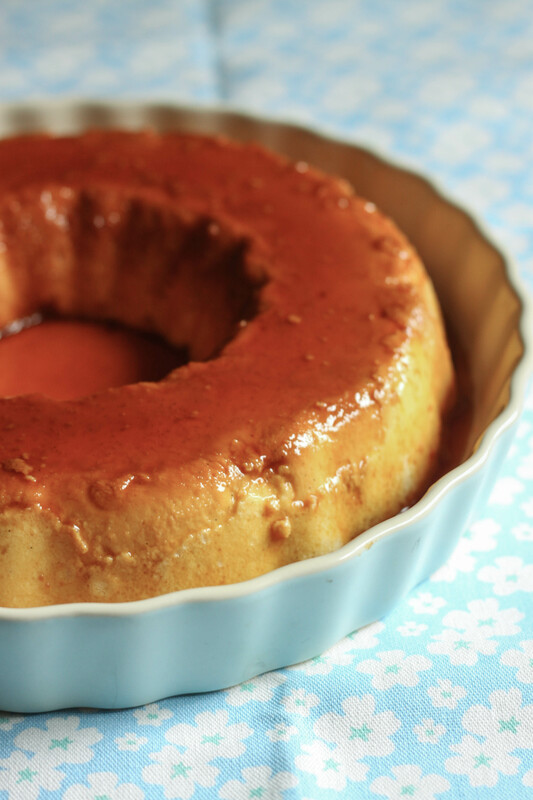 The one dessert that is always present at all of my family’s gatherings is this flan. My aunt, Carmen, makes it for every occasion. It is not your typical jiggly flan. This one is firm, creamy, and substantial. 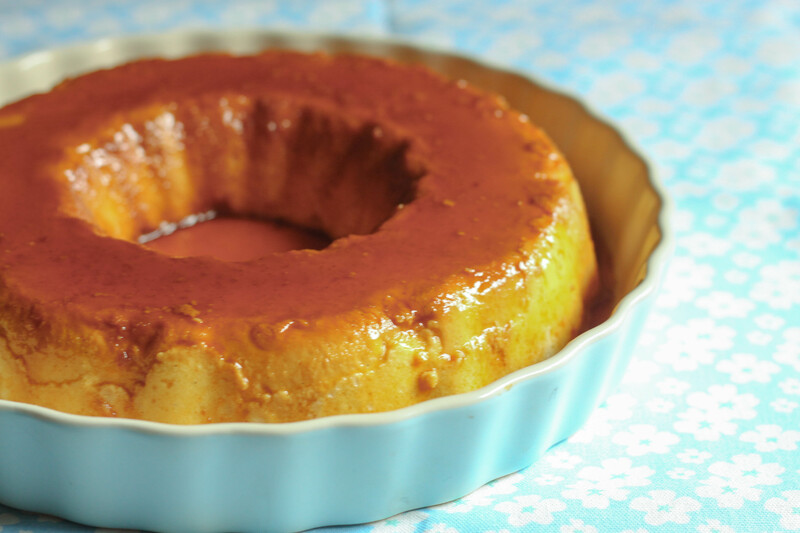 The first time I wanted to make the flan, I called my aunt and asked her for the recipe. I never learned how to make the recipe because I had no need to. She always brought a flan to all events. I purchased the ingredients needed and started making it. 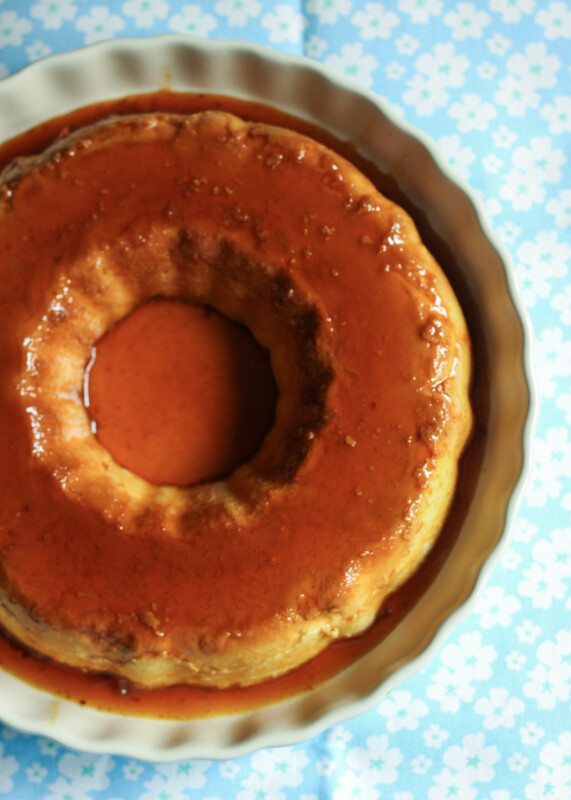 I noticed that the condensed milk can had a recipe for flan… my aunt’s recipe was pretty much the same. All these years I thought my family was making the most delicious and unique flan. It was like the moment when Phoebe and Monica from Friends realize that Phoebe’s cookie recipe was simply the Nestle Toll House recipe on the back of the chocolate chip bag. The only difference is that my aunt adds a little something extra to her flan: 1/4 cup of Amaretto or Grand Marnier. I substitute the vanilla extract for the seeds from a vanilla bean. I love seeing the little specks of vanilla throughout the flan. It might pretty much be the recipe from the back of a can, but it’s still my aunt’s recipe in my eyes. And a bite of it still reminds me of being home with family. Adapted from the recipe on the back of the Carnation condensed milk can. You will need a bundt cake pan. I use a silicone one. Also, a deep roasting pan (about 13 X 9 inches) for a bain marie. Preheat the oven to 350F. Place the bundt cake pan inside the roasting pan and set aside. In a small saucepan, place the sugar over medium heat. You want the sugar to melt and turn a deep caramel color. Swirl the pan every once in a while to ensure that all of the sugar melts. Once most of the sugar has melted, turn the pan to low to avoid burning the caramel. Pour the caramel in the bottom of the bundt pan. In a blender, place the cream cheese, condensed milk, evaporated milk, eggs, Grand Marnier, and Amaretto. Scrape in the seeds from the vanilla bean. Blend until completely smooth. Pour mixture into bundt pan. Assemble bain marie: carefully add hot water to the roasting pan to 1 inch depth or 1/3 up from the bottom of the bundt pan. Bake for 50 minutes to an hour. The flan should be firm at the edges, but still jiggle in the center. Remove pans from the oven. Remove flan from the hot water. Let come to room temperature. Refrigerate for 2 hours, until cold, or overnight. Remove from the refrigerator 10 minutes prior to serving. Gently run a thin metal spatula around the rim of the mold and invert into a serving dish. Pour any caramel around the flan. Remove any caramel pieces that have solidified. Love this! It looks delicious!